On our “EurailMadDash” this summer we allowed more time for Prague than we spent in any other city – and still wish we’d had more time. 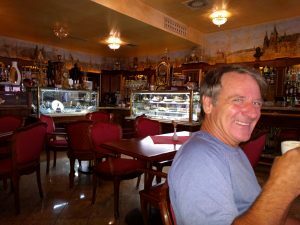 Neither Rand nor I had been to Prague before, but we’d heard of its beauty, culture and intrigue. We were enchanted and look forward to returning and staying longer next time. To get a quick overview of the city, we tried a Segway tour and would happily recommend it – although not in place of more time at a slower pace. I sped this video up so it’s a tour of Prague in minutes! Prague is the capital city of the Czech Republic and it’s notable for its many church spires, colorful homes, buildings, and churches. It has an eclectic mix of baroque, Gothic, and medieval architecture reflecting its widely ranging fortunes and the diverse groups who ruled the city over its long history since its founding in 885 AD. 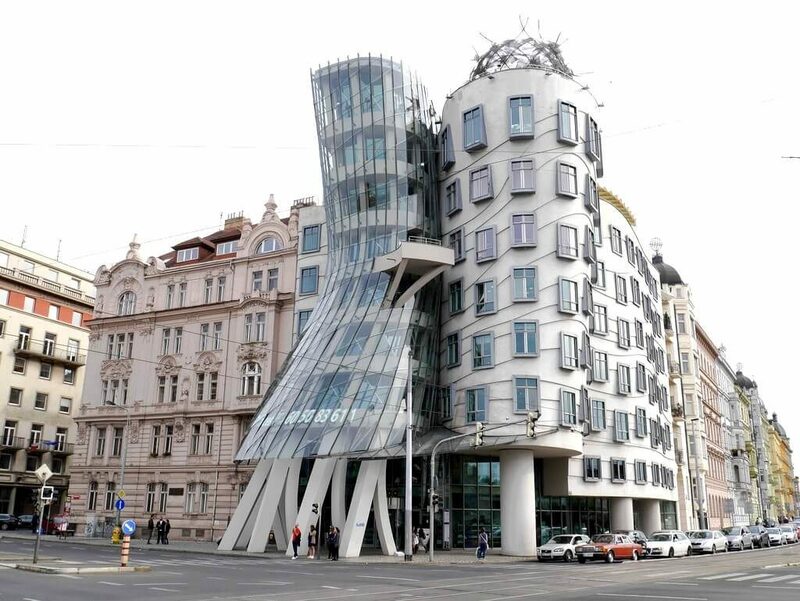 One of the most interesting aspects of Prague is its stunning art and architecture. Its pre-war buildings have the elegant architectural detail one sees in other European cities. 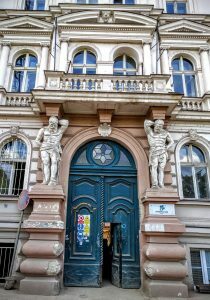 Beyond that, many Prague buildings incorporate artistic designs and artwork like sculptures on the facade that turn even ordinary buildings into works of art. Even many of the sidewalks are works of art in Prague. Prague is a city with an abundance of public art. Some are symbolic, some are contemporary or abstract and some even date back to the communist era but some are simply provocative and leave you thinking. 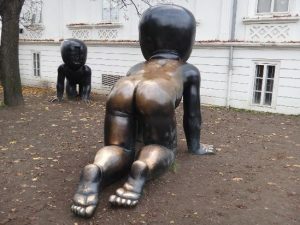 Located in Kampa Park, these giant babies by Czech sculptor, David Cerny, can be climbed on – if you can get a handhold on their slippery polished bronze surfaces. Supposedly the babies are a symbol of the communist era, unable to reach adulthood, their growth stifled by totalitarian rule. 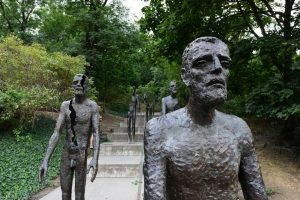 Another memorable sculpture, also appearing in our Segway tour of Prague, is the Memorial to the Victims of Communism by sculptor Olbram Zoubek. The sculpture depicts seven bronze figures descending a flight of stairs. The statues appear more “decayed” the further away they are from you – losing limbs and their bodies breaking apart. The figures symbolize how political prisoners were affected by Communism. Another David Cerny sculpture in front of the Kafka Museum is a fountain with two men on either side peeing. The shape of the basin below is the outline of the Czech Republic. Their peeing motion spells out quotes from political leaders. Visitors can text a phrase to a number displayed next to the sculpture and watch while the figures write it in the water. Who’s that dangling precariously by his hand from a tall building in Prague’s Old Town? Sigmund Freud! 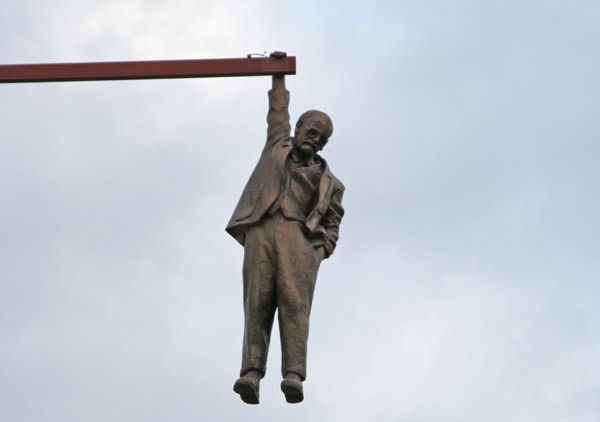 The artwork’s meaning is appropriately ambiguous, with some suggesting that the sculpture is mocking one of the famous psychoanalyst’s well-known phobias. Others see it as a comment on the role of intellectualism in the post-modern age. It’s worth noting that Prague offers a lot for the money. Through Airbnb, we stayed in a luxurious penthouse apartment on the river complete with fully stocked kitchen, large living spaces, laundry in the apartment, his and her bathrooms — and even a sauna — for less than we paid to stay in what was essentially a maid’s room on the lake in Lugano Switzerland. While Prague living is inexpensive, the city is rich in charm. 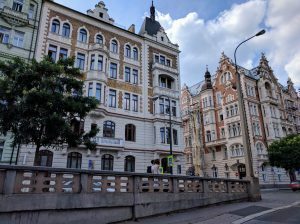 It seems to have held onto its medieval past (cobblestone streets, charming medieval houses), and retained its elegant pre-WWI feel through its beautiful architecture which was spared the worst of Nazi destruction because even Hitler had a fondness for Prague. Prague seemed to suffer the most during the communist (1948-1989). After the downfall of communism, Prague’s old town was in a terrible state of decay after decades of neglect. Houses were blackened with soot and dirt, walls were peeling, roofs leaking. There is a lingering darkness in mood that you pick up on now and then and much of the elegant architecture and pre-WWII public art is in disrepair, but there is also a renaissance going on, complete with restoration of the old elegance of the city. Prague is shedding the reminders of Soviet oppression and restoring its pre-communist beauty that fell into disrepair during those bleak years. Now the feel of the city is overwhelmingly vibrant freedom, artistic expression, and urban renewal. John Lennon’s Freedom Wall (pictured at the top of this post) is a great example of modern Prague. Toward the end of Communism in the 1980s, students started writing John Lennon lyrics on this wall as a way to air their grievances. 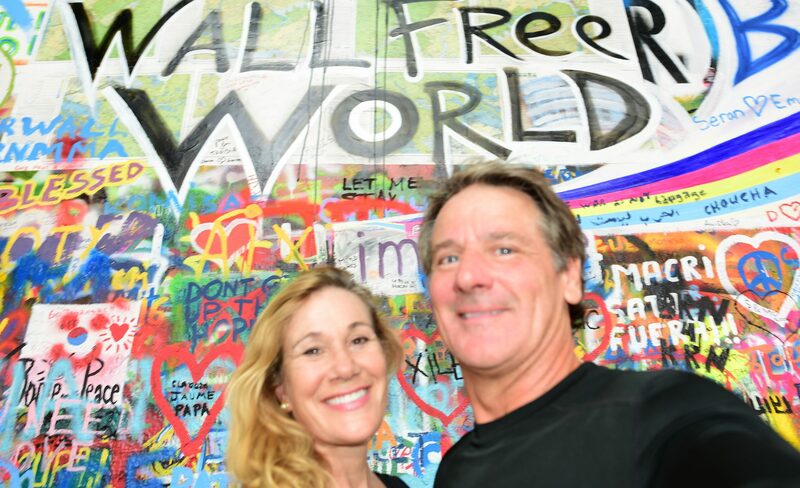 Today, the wall represents love and peace. Everyone is still allowed to write or paint on it and when we were there, several people were at work with their paints. Prague is much smaller and more walkable than we imagined. After we did our Segway tour, we walked everywhere. You can experience all of Prague by foot. And if you need a ride, in addition to cabs and private car services, Uber works in Prague – which we can’t say for every European city we visited. Also, Uber can often be cheaper than local taxis for two reasons: 1. taxis may not be metered and you may not know whether the price you’re asked to pay is reasonable or a rip-off. 2. Uber is trying to get established in European markets so they subsidize the rides to gain market share, making the rides cheaper for the riders. Prague’s Old Town Square is the historic center of Prague. There is a balcony from which the communist state was announced – and then cheered every year thereafter, and a place where Protestant nobles were beheaded. The square looks peaceful today, but it has been the site of numerous bloodbaths. Prague was actually the last European battlefield of WWII. On May 8, 1945, a week after Hitler’s suicide and the same day people in Paris and New York were celebrating victory. Three days earlier Prague had risen against the Nazis and in retaliation the Germans obliterated one wing of the town hall with a tank and killed over 5000 Czechs in other parts of the country before the Russians liberated Prague two days later. As an American, I felt bad learning that our forces could have saved the Praguers earlier, but did not intervene because of the Yalta agreement. The Astronomical clock in Old Town Square seemed to be the biggest draw in the square. Approaching each hour, it is surrounded by dense crowds for the bell-ringing that happens on the hour. 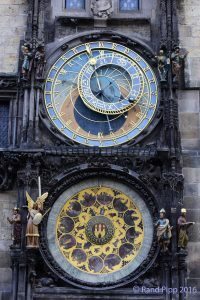 The clock has 12 medallions with the signs of the zodiacs, and is supposed to have an hourly procession of Apostles and moving statues. It has been described as a “visualization of time like no other instrument in the world.” Maybe that once was true. The detail and artistry of the clock do make it beautiful to look at, but the hourly chime that we and so many others lined up for is anticlimactic and disappointing due to the fact that many of the moving parts were not working. We found it much more enjoyable to sit in a cafe above the square and enjoy coffee and confections and watch over the crowds below from our window-side table. The baroque spires of Tyn and St. Nicholas churches border Town Square. They are the churches you see in all those travel ads for Prague. What the travel guidebooks don’t tell you is that Prague citizens were early Protestants with a penchant for hurling Catholic officials off bridges and out of the windows. The Jesuits were sent into Prague to threaten the citizens back to Catholicism and built gorgeous churches like St. Nicholas to impress the Praguers back to the church. St. Nicholas set out to accomplish that mission with huge golden idols above each chapel and elaborate biblical stories covering the walls. At the top of the astronomical tower is one of the world’s most beautiful libraries. They don’t allow photographs so I’m sharing one of the public ones. The photo doesn’t do justice to how gorgeous the library was, with elegant woodwork and painted ceilings. 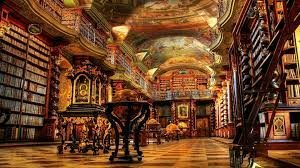 You have to look into the library from the doorway but it’s still breathtaking. View from the top of the Klementinum. 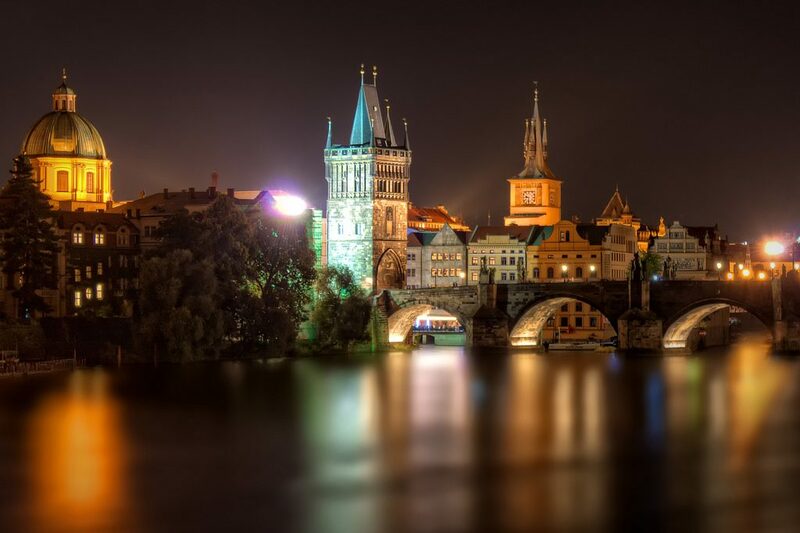 The famous Charles Bridge that crosses the Vltava River is an iconic Prague sight. It is one of the most well-known sights named in honor of Charles IV (Karl) in Prague. Construction started in 1357 under the auspices of the king and opened in 1402. The medieval bridge is reserved for pedestrians and is thronged with vendors, musicians and tourists. 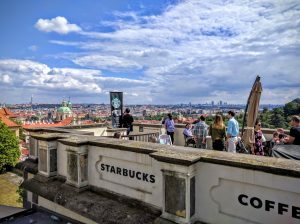 One of the best views of the city is from the Starbucks adjacent to Prague Castle. 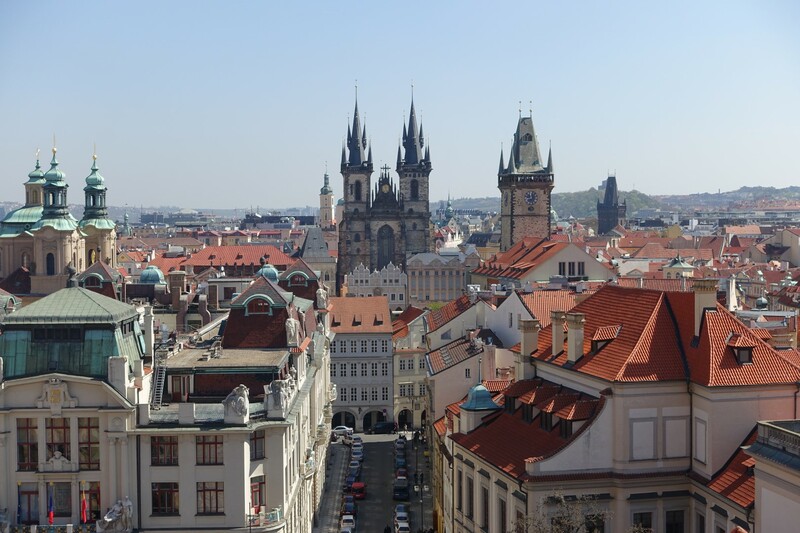 Prague has a reputation as the “city of the hundred spires.” In reality, Prague has several thousand towers and spires. Petrín Park is the city’s biggest and most beautiful park, with sweeping views of Prague. You’ll find a garden, a maze, and a lookout tower that resembles Paris’ Eiffel Tower. Above the city, high on a hill, stands the medieval Prague Castle, symbol of the Czech state for over a thousand years.Prague Castle was built around 880. It is the official residence of the president of the Czech Republic and there are guards on either side of the entrance. Václav Havel lived there from 1989-1992 when he was the last President of Czechoslovakia and then the first President of the Czech Republic after the Czech-Soviet split. The Czechs claim Prague Castle is the largest castle in the world. It is about the size of seven football fields and it contains the Lindner Hotel in a medieval building, courtyards, palaces, museums, the garden, the Bohemian Crown Jewels, St. Vitus Cathedral with its unique baroque architecture, St. George’s Basilica, as well as the Old Royal Palace. 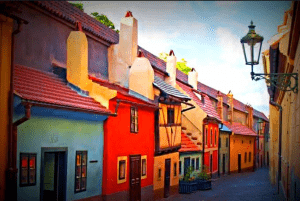 A pretty part of the Prague castle district is Golden Lane, lined with tiny colorful houses. The Castle District, known to Czechs as Hrad, is home to winding cobblestone streets and many quaint shops and restaurants. Prague’s Jewish Quarter, formerly a walled ghetto, is one of the most complete collections of Jewish historical monuments in Europe today and one of the most popular attractions in Prague. Ironically, Hitler saved it from Nazi destruction because he wanted to make the area a museum to the Jewish race he was trying to exterminate. 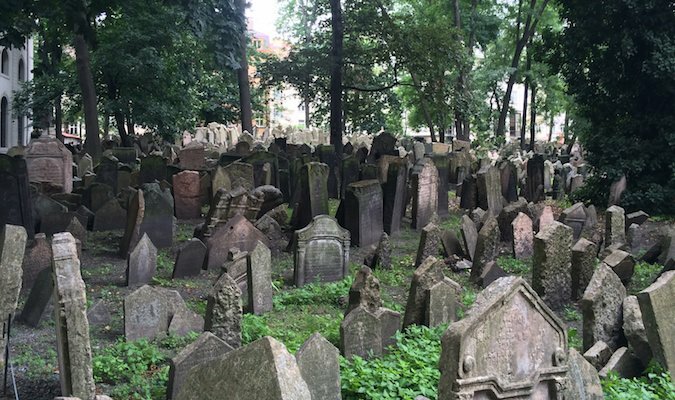 Now, the museums, synagogues, and historic graveyard in the area honor the history of what was once one of the largest Jewish communities in Europe. Within the cemetery is the Pinkasova synagogue. After the war, someone painted the walls with the names, birthdates, and deathdates of the 77,297 Czech Jews killed by the Germans. The Communists didn’t take good care of the Jewish museum. After the Yom Kippur War, they ripped out the names and even installed some anti-Israel exhibits in this area. Artists are now painstaking painting the names back in. 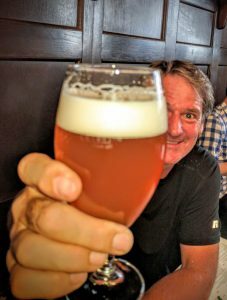 Czechs proudly hold rank as the number 1 place in the world in beer consumption per capita No wonder, their beer is so good…and cheap; often it is even cheaper than a bottle of water! What Goes On After Dark on Golden Glow?